Thousands of licensed acupuncturists, including physicians and dentists, currently practice acupuncture in the United States, according to the National Center for Complementary and Alternative Medicine. Acupuncture is generally considered to be safe, with few reports of adverse side effects, but sensations like tingling and numbness may occur during and after treatment. Talk to your doctor before starting acupuncture treatments to ensure proper care. Acupuncture is a form of treatment that has been practiced for thousands of years in traditional Chinese medicine (TCM). During acupuncture, thin metal needles are used to pierce the skin at specific points that are chosen by the practitioner to treat the patient’s specific needs. According to TCM, acupuncture points are on pathways called meridians through which vital energy flows, affecting the entire body. Sensations like tingling and numbness are characteristic of a phenomenon known as “de qi” and are thought to signify effectiveness of the treatment. According to acupuncturists who practice in the tradition of TCM, de qi occurs when the needle stimulates an acupuncture point. De qi occurs during treatment and is characterized by a number of sensations, which may include soreness, heaviness, or numbness. In a 2009 study conducted among Korean acupuncture patients, nearly 40 percent of those surveyed reported experiencing de qi. When describing their feelings during de qi, however, only 0.9 percent of the 1,095 patients surveyed listed numbness among the sensations they experienced. Electroacupuncture is a relatively new form of acupuncture. It is similar to traditional acupuncture in that practitioners insert acupuncture needles at the same points as those used in traditional treatments. Electroacupuncture differs in that small clips are connected to those needles, which are attached to a device that generates an electric current. 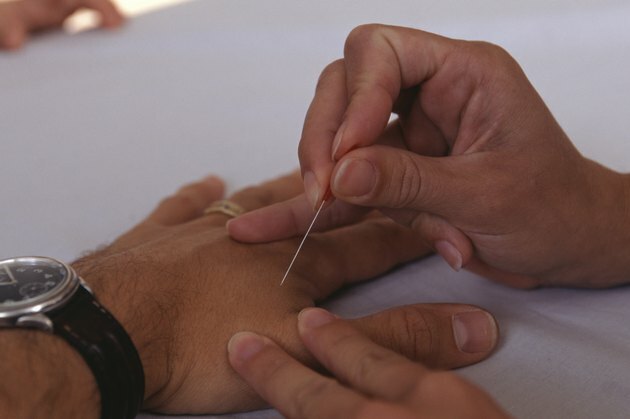 Two needles are used at the same time to all allow the current to pass from one needle to the other, stimulating the acupuncture points and the surrounding area. While patients may feel a tingling sensation as a result of the electric current during electroacupuncture, there is no tingling in most cases. Many acupuncture points lie directly over nerves, and acupuncturists need a thorough understanding of anatomy to avoid injuring those nerves. The authors of a study published in the Archives of Family Medicine in 1999 surveyed published reports of adverse effects from acupuncture and only found a handful of occasions on which practitioners directly damaged their patients’ nerves. However, on the rare occasions that nerve damage occurs, neuropathy can result. This condition’s symptoms may include tingling or numbness. To avoid complications from acupuncture, always check your acupuncturist’s credentials, and consult your doctor before pursuing acupuncture treatments. “Medical Acupuncture”; The Necessity of Qi Sensation (De Qi); Alev Inez Wilk, M.D.